The rare genius of Rabbi Dr. Abraham J. Twerski brings us the Mishnah as we've never seen it before. Most people view the Mishnah - and rightly so - as the basis of halachah. Less well known, though, are the Aggadic and ethical aspects of the six tractates of Mishnah -- the soul, so to speak, of the Mishnah. Rabbi Dr. Twerski is the scion of a great Chassidic dynasty, a psychiatrist who has spent a lifetime delving into the secrets of the human psyche, and, of course, a healer. In Messages From Mishnah he brings his unique perspective, incisive intellect, and warm understanding of human nature to the timeless words of Mishnah, revealing its riches, depth, and the very human lessons we can find there. 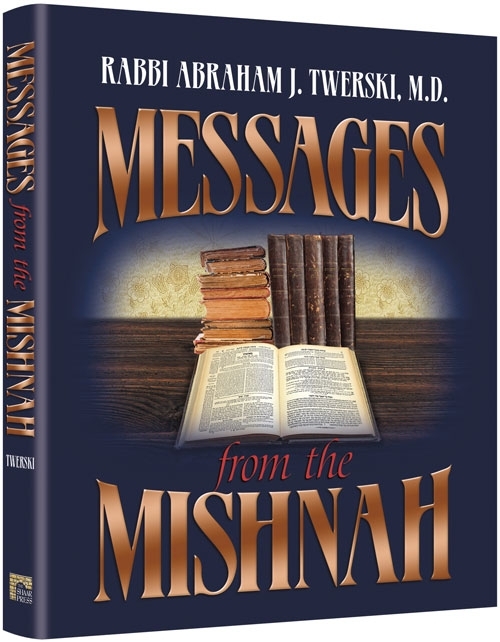 Rabbi Dr. Twerski draws upon a wealth of varied Torah sources to examine each Mishnah, finding in its words messages that are startling in their relevance to today's issues and challenges. The halachos of the Shema can teach us how to avoid the dark side of technology; the laws of charity serve as a springboard for discussing how we interact with others. Rabbi Dr. Twerski, in addition to his many other accomplishments, is a born storyteller, and his tales of Chassidic masters enliven each page. The Mishnah's tractate Avos, Pirkei Avos, has long been studied and beloved for its ethical teachings. Now we can discover the many insights and life-affirming messages that all of the Mishnah has for us. Large 8-1/2" x 11" "coffee-table" format. A beautiful gift!